The splendour of Agra- the capital of India under the mighty Mughals- still remains undiminished after 500 years. A minor administrative unit saw its transformation to a world renowned city with the coming of Mughals, Centered around the timeless creation, Taj Mahal, the city of Agra remains unparalled in history. The epic 'Mahabharata' refers to Agra as Agarbana' a vital part of Braj Bhumi. In recent history, the town came into its own under the soverignity of Raja Badam Singh. And in spotlight, with the arrival of Sikandra Lodhi, who made it his capital. The golden age of Agra Pegan in 1526 A.D, and the following centuries saw the rise of Mughal monarchy, with emperors Akbar, Jahangir and Shah Jahan, bestowing their time and wealth to transform Agra into to a centre of art, culture, learning and commerce. Taj Mahal is regarded as one of the eight wonders of the world. Built entirely of white marble it has been described as a Poem in Marble'. Its stunning architectural beauty is beyond adequate description. Today, it stands in all its majesty to gently tell us about Shah Jahan's immortal story of love. 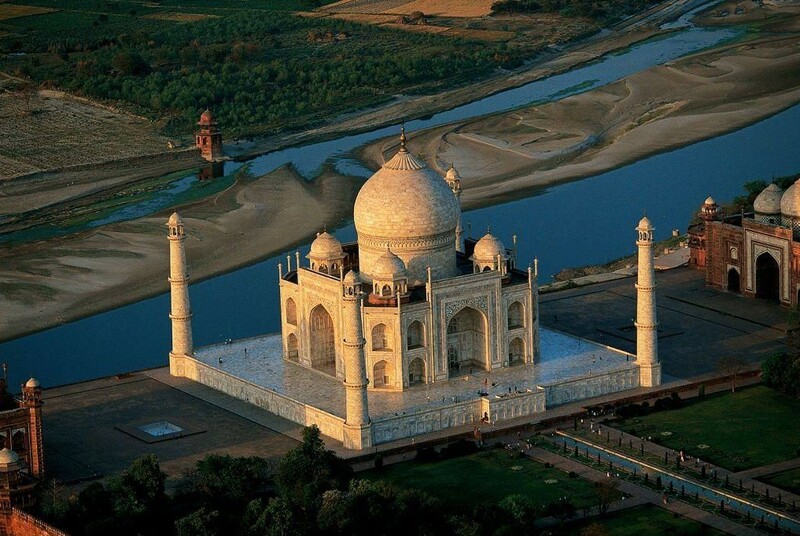 Taj Mahal was built by Emperor Shah Jahan in the memory of his dear wife and queen Mumtaz Mahal. The construction of the Taj started in 1631 and was completed in 1653. The construction documents show that its master architect was Ustad Isa Khan, the renowned Islamic architect of his time. As many as 20,000 gifted workers from India and Central Asia were brought to produce the exquisite marble screens and pietra dura-marble with inlay work to bring about this ‘labor of love'. Expert craftsmen from Delhi, Kannauj, Lahore, and Multan were employed. In addition, many renowned craftsmen from Baghdad, Shiraz and Bukhara worked on many specialized tasks. The Taj stands on a raised, square platform with its four corners truncated, forming an unequal octagon, Its striking central dome is surrounded by smaller domes and its arches are embellished with scriptures from the Holy Quran. Inside finely cut marble screens inlaid with some 43 different types of precious stones shield the two subterranean vaults housing the tombs of Mumtaz Mahal & Shah Jahan that lie side by side, as Shah Jahan was finally buried here beside his beloved wife. 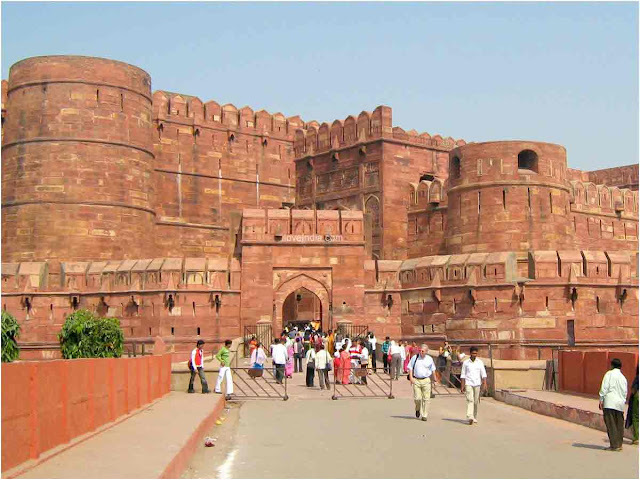 Emperor Akbar started constructing this massive fort on the banks of river Yamuna in 1565. 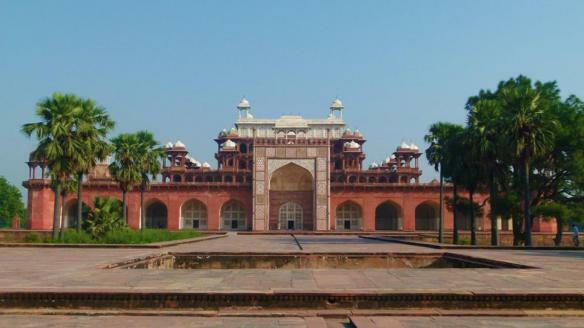 Additions were made to it by his grandson Shah Jahan. The huge walls of the fort stretch for 2.5 km and are surrounded by a 10 m wide moat. Out of the three gates, only Amar Singh gate is open now. The fort is open from sunrise to sunset. The forbidding exteriors of this fort hide an inner paradise. Diwan-e-Am - This hall of public hearing is the place where the Emperor heard the petitions of the public and met the officials. Diwan-e-Khas - This was the hall of private audience. Octagonal Tower - It was here that Shah Jahan spent last seven years of this life imprisoned by his son Aurangzeb. Sheesh Mahal - It is a creation of myriad glass pieces and central fountain. Jahangiri Mahal - It was built by Akbar as women's Quarters. 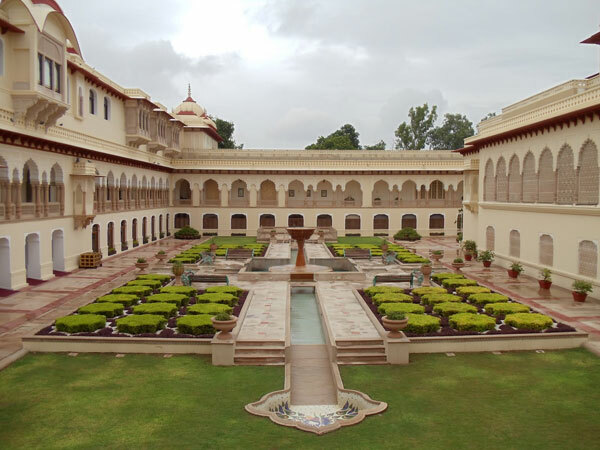 Jehangir Palace - This was built by Akbar for his favorite son Jehangir to provide him with the comfort and luxury inside. Mina Masjid - It is enclosed on all the four sides by high walls. The marble mosque has three small arches in its facade, which are plain and unadorned. 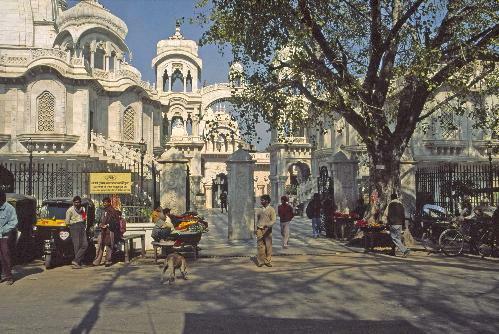 Machhi Bhawan - Opposite to the Diwan-E-Khas is the machhi bhawan, the fish enclosure. Anguri Bagh - These 85 square geometric gardens lie to the left of the fort. Jama Masjid, the sacred section of the Fatehpur Sikri. 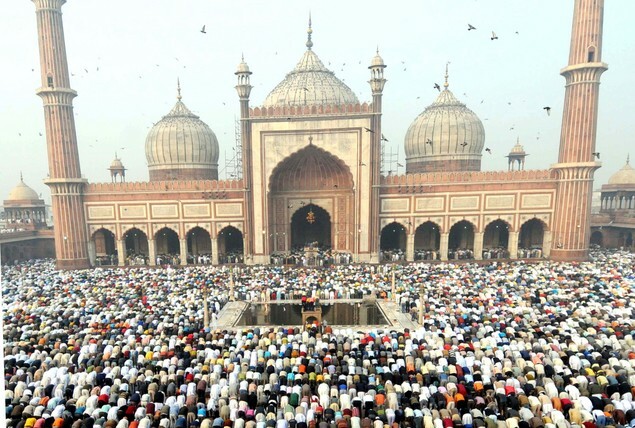 Built in 1572 AD, this is one of the largest mosques of India. 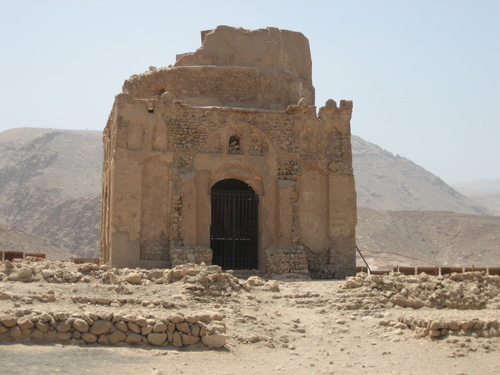 It is also known as Darrgah Mosgue. It draws upon both Persian & Hindu design and is said to be a copy of the mosgue at Mecca. The unique tomb in red sand stone was built in 1611 A.D. in memory of Emperor Akbar's Goan Christian wife Mariyam. 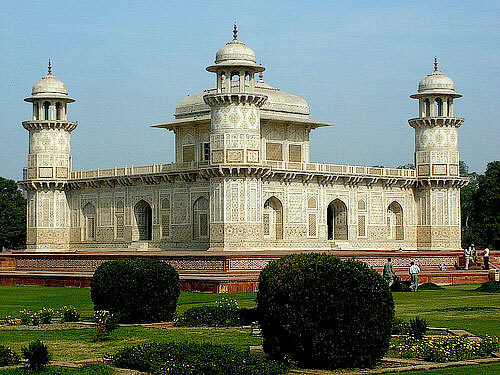 The sandstone-and-marble tomb of Akbar lies in the middle of a garden at Sikandra, 4 km from Agra. Akbar inaugurated the construction himself and created a synthesis of Islamic, Hindu, Buddhist, Jain & Christian motifs and styles. His son, Jehangir, completed the mausoleum. It features three storey minarets at each corner and is built of red sandstone inlaid with white marble abstract patterns. Sikandra takes its name from Sikander Lodi, the Sultan of Delhi during 1488-1517. He built the Baradi Palace in the mausoleum garden. Like the cactus flower that for a moment adorns the desert, so was the town of Fatehpur Sikri, having c brief span of glory. It was abandoned only after 15 years of its construction, due to scarcity of water in the town. 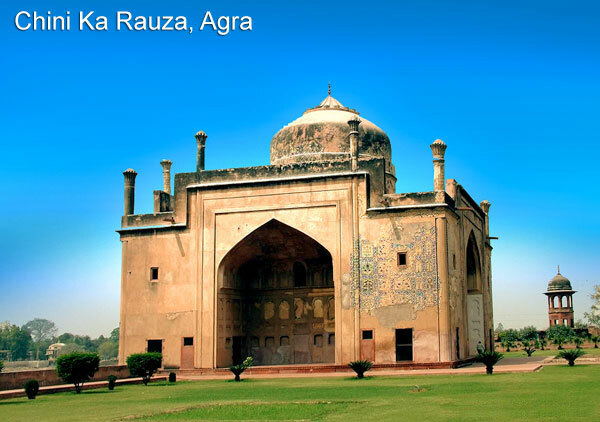 This magnificent town was once the capital of Mughal Empire. Here, the beautiful marble tomb of Sheikh Salim Chisthi attracts thousands of people who seek blessing of the reverend saint. Reputed to be an Afzal Khan creation, a high official in the court of Shahjahan, Chini Ka Rauza is decorated by glazed files on the facade. It depicts the Persian influence on Mughal architecture. Laid out in 1528 by Babar, this is the earliest Mughat garden. If is said that Babar was temporarily buried here before being permanently interred at Kabul in Afghanistan. An ancient city which dates back to 1500 BC, Mathura is credited to be the birthplace of Lord Krishna, making it a sanctified land, a popular destination for pilgrims. 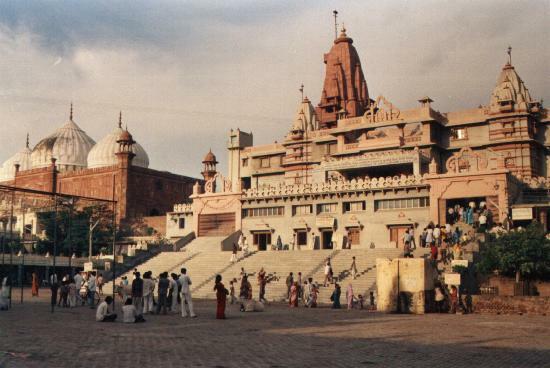 Just 10 kms away from Mathura in Uttar Pradesh, the nucleus of Brajbhoomi, is Located north-west of Agra. Tajmahotsav: A festival of art, craft, culture and celebrations, organized by U.P Tourism, is held every year between 18th to 27th Feb.
Kailash fair (Aug/Sept) - Held at Kailash it's a major fair celebrated in honor of Lord Shiva who is believed to have appeared here in the form of a stone lingam. Sheetala fair (July/Aug) - It is held near Delhi Gate. Bateshwar Fair - This festival is held annually during the month of November at Bateshwar, 65 kms from Agra. Urs (Fatehpur Sikri) - This fair is organized at Sheikh Salim Chisthi's Dargah, during the month of Ramzan. Handicrafts - Agra is known for its fabulous handicrafts, made of marble and soft stone inlay work. Besides inlay work other handicrafts are: leather ware, brassware, carpets, jewellery and embroidery work. Leather Items - Agra is the hub of hand made leather items. Main shopping areas - Sadar Bazar, Kinari Bazar, Raja-ki-Mandi, Sanjay Place and the Taj Mahal Complex. Shopping is recommended at the Govt. Emporia or Souvenir Shops approved by Uttar Pradesh Tourism. 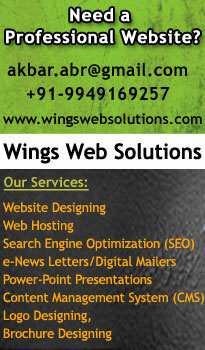 In terms of connectivity, the is destination are well defined by all means of transport be it Air, Rail or Road. Air - Agra's Kheria Airport 7 kms from town connects Agra with Delhi, Khajuraho and Varanasi. Rail - Agra is connected by rail with major cities. Shatabdi and Taj Express and Intercity express link Agra to Delhi. The palace also visits Agra city on wheels. Road - National highway Nos, 2, 3 and 11 pass through Agra and link it to all parts of the country. Distance: Delhi 204 kms, Jaipur 237 kms, Khajuraho 395 kms, Mathura 54 kms, Gwalior 110 kms, Lucknow 35 7 kms, Bharatpur 54 kms, Varanasi 605 kms.